2019-04-03 16:45:11 I can't help it if I'm lucky. 2019-04-01 03:28:08 Way to go, Louie! Off to a fine start. 2019-03-31 17:41:18 Django Reinhardt only had two good fingers on his left hand!!! 2019-03-31 06:41:57 A new Captain is a good start. Go team. Safe travels to Bob & the band. 2019-03-30 17:33:38 I've just posted on the message board inquiring how we can drop our nonexistent members. Maybe I'll get an answer, and at some point we can be a complete team again. Hope springs eternal. Best of luck with the new tour. 2018-12-05 20:02:12 Wow! Thank you. Thank you. Our 3-person team almost made the front page! 2018-12-04 13:34:37 Grats on winning the pool, Louie! Glad you were able to catch a show. This is only the second year since 1987 that I was not able to attend a concert. Interesting changes to GSS lyrics. Even more rave reviews than usual. Cheers! 2018-11-12 21:02:32 Ah-ha! Just as I had hoped. Folks have transcribed the new lyrics to Gotta Serve Somebody and posted them in the Expecting Rain Discussions. 2018-11-12 20:31:02 Of course, "crowed" should be "crowd." So much for my proofreading. 2018-11-12 20:29:00 Excellent show at Eastern KY U. last night. Even though this was a university venue it appeared to me that the crowed had more bald and gray heads than usual and not too many from the younger generations (e.g., compared to Indiana U. last year). Nonetheless, Bob was in fine voice. I am so glad he's abandoned the standards and is performing songs from his catalog. It's always fun to hear the new arrangements he adopts. Especially intriguing was his new take on Like a Rolling Stone. I was unable to catch all the new lyrics to Gotta Serve Somebody. So I hope someone has transcribed them someplace. Finally, Bob doing James Brown as the closer? Who woulda thunk it? But it worked. 2018-10-11 16:25:37 So glad you could join me at the top, Pequod. 2018-10-11 14:30:19 Now you're a King for two days. WTG! 2018-10-09 17:05:50 Holy cow! #1 for a day! I owe it to a simple twist of fate. 2018-03-22 16:28:06 I'm in. Go 3 man team! Safe travels and good music for Bob & the band. 2017-10-31 14:04:54 The Chicago show was a winner. "Freedom March" was the highlight from Mavis. I like the standards. "Autumn Leaves" and "Once Upon a Time" were especially fine. The new arrangement of "Thunder" was quite good. There is a high caliber video of this and "Blowin' in the Wind" on YouTube. "Tangled" is indeed a work in progress. It has a bit of talking blues to it but is not yet there. A fine time was had at the very first concert at Wintrust, a smallish basketball arena with rather good sound for the multi-purpose space.Cheers. 2017-10-30 17:13:56 Fun times in Bloomington last night. (Even though Mavis referred to the town as "Bloomingdales.") 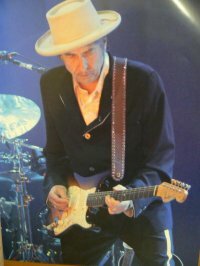 Despite the tour's standard setlist Bob was able to make old songs new again with new arrangements--some of which worked (Thunder on the Mountain) and some that didn't (Tangled Up in Blue). I could have done without Bob's crooning 5 "standards" although, to me, Autumn Leaves was tolerable. I thought the highlight came at the end of his regular set with the 4 song series of Desolation Row, Thunder on the Mountain, Autumn Leaves, and Love Sick. All in all, I was glad to have made the drive from Louisville. 2017-10-14 18:41:25 Glad to hear it, Pequod. It'll be the Bloomington, IN, show for me. 2017-10-14 18:37:10 Glad to hear it, Pequod. It'll be the Bloomington, IN, show for me.